Scott Pilgrim is a movie. Scott Pilgrim is a book. Scott Pilgrim is Canadian. Scott Pilgrim is a douche. We love Scott Pilgrim. He may be with fault, but they are fults we can live with and though we may complain once and a while we’ll stand by him. 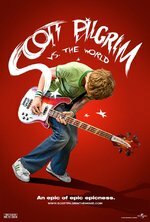 This week we review Scott Pilgrim. Don’t believe me, then listen for yourself.